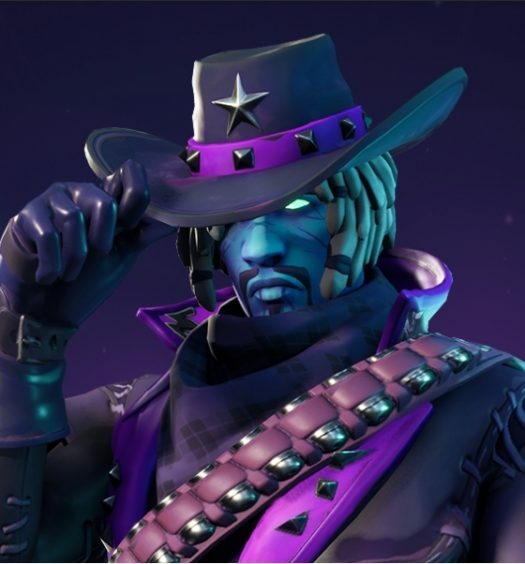 Week nine of Fortnite’s fifth season is upon us, and with it come new challenges. This week sees another unique challenge tied to shopping carts and ATKs. Searching one chest in specific locations also makes its return. If you aren’t quite there, these challenges should hopefully help you get further to unlocking your tier 100 battle pass skin, Ragnarok. 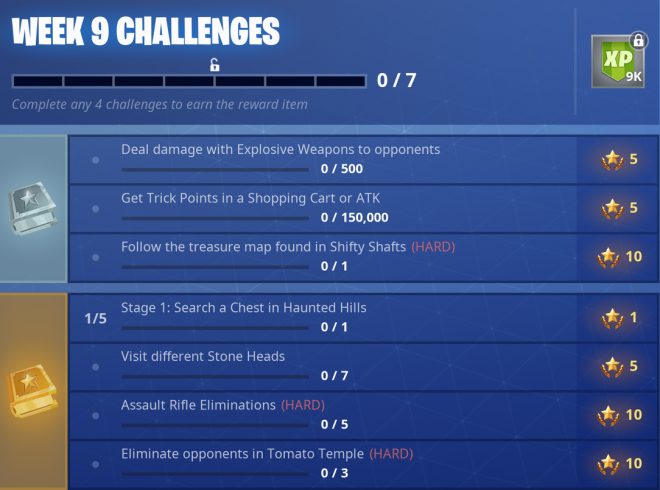 Let’s take a look at the list of challenges for week nine. This is about as basic as challenges come. You’re going to want to damage opponent’s using any sort of explosive weapons. Both types of grenades count. So does the remote explosives, and the grenade/rocket launchers. Pick your poison and get to it. This will come rather quickly if you’re using explosives or an explosive launcher on an enemy with full health and shields. This will be 200 damage outright. If you’re playing a mode where players get downed, finishing them with explosives will be another 100 damage. That’s the quick way to do it. 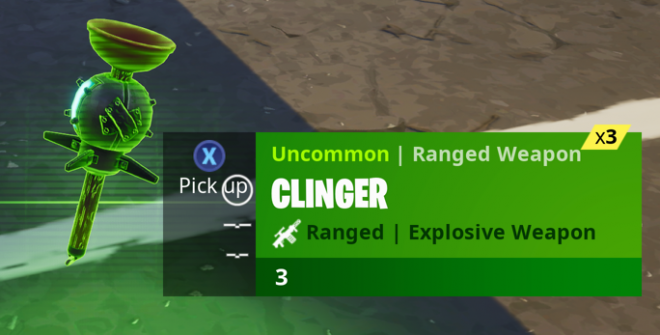 If you don’t mind taking your time, you could also down an opponent with a gun, and finish them by tagging them with a clinger, or throwing remote explosives right under their crawling body, and detonate. Doing it this way will take about five different people. Here are the weapons you want to be on the lookout for. This challenge is a lot easier than it may come across. This challenge is easiest with two players but can be completed solo. 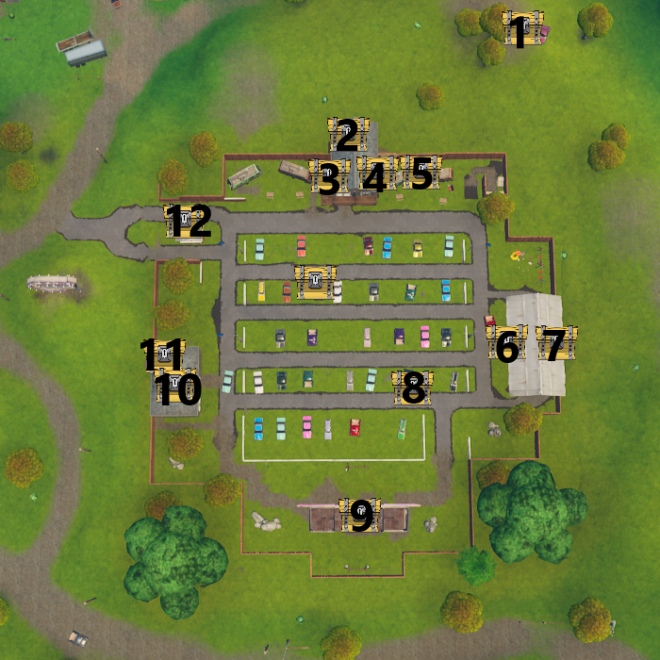 Below are brief descriptions of both methods, as well as a map of where you find shopping carts and ATKs. 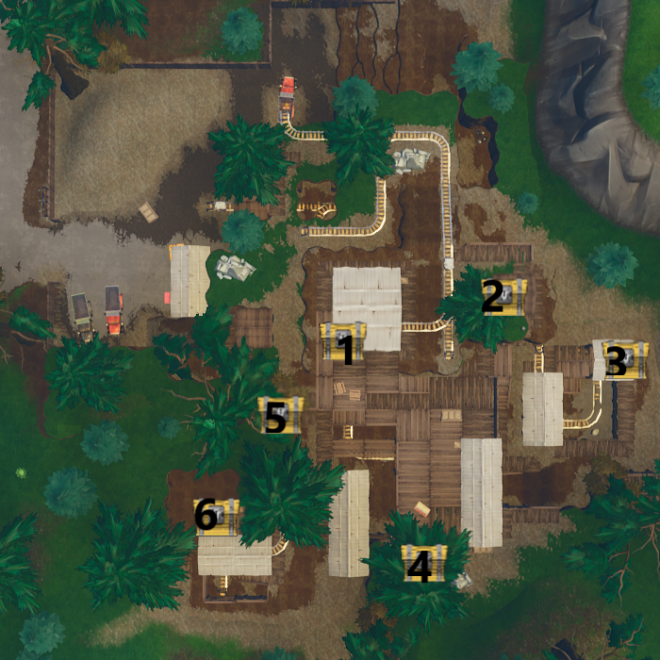 It is highly recommended that you do not use the ground level pre-built ramps for this challenge, as most of them will get you almost no height, or little to no points if possible. Also, it’s highly suggested not to use a rift. While this can get you points, the odds of landing safely without destroying the vehicle are minimal. Grab an ATK, one person drives while the other hangs off the back. Make sure the person hanging off the back has adequate materials. Simply build ramps as your buddy is driving, drive up the ramps at least three-four levels up and then launch off, being sure to land right-side up. Doing so should net anywhere between 25,000-40,000 points each try. Adding in a little bit of drift can cause a small increase in the numbers, but adds to the possibility of a rollover or failing the trick. It will take about 4 – 6 times to get the 150,000 points required. Grab an ATK. Build a ramp two-three levels high. Drive up the ramp with your ATK and be sure to land right-side up. Turn around and go back to the start of the ramp and do it again. This will net you anywhere from 15,000-25,000 points each time. The goal is 150,000 so it will roughly 5 – 8 times depending on how many points you gain each time. 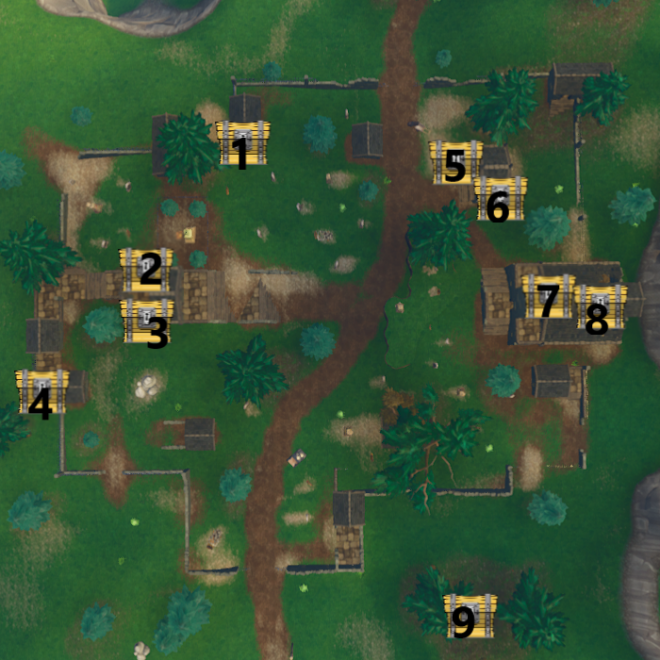 The treasure map in Shifty Shafts can be found in the lower mine area. The map is between the central and southern parts of the mine up against a wall. Here is the map that you’ll be presented with. Look familiar? 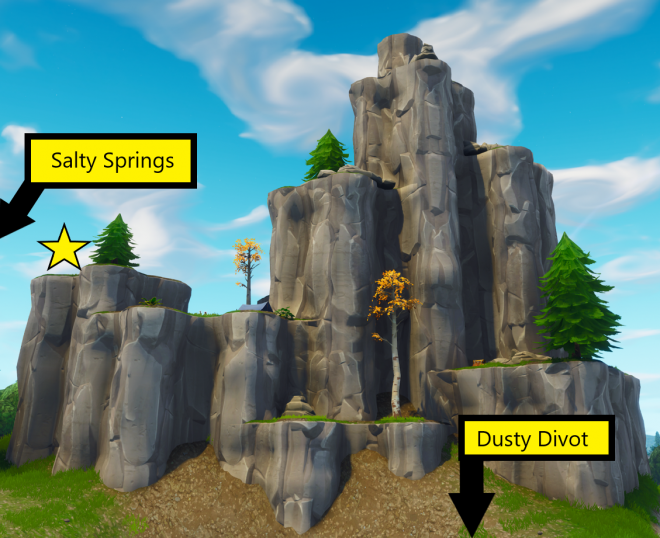 You’re going to want to head to candlestick mountain The battle star will be on one of the higher southern ledges, the one closest to Salty Springs. Here is a map to better pinpoint the location. Horray! The exciting challenge to search one chest in five different locations has made a return. For this week, simply head to the designated locations and open one chest. Unfortunately, you still need to finish the game before you can head to the next location, so getting all five chests at each location will take five games total. 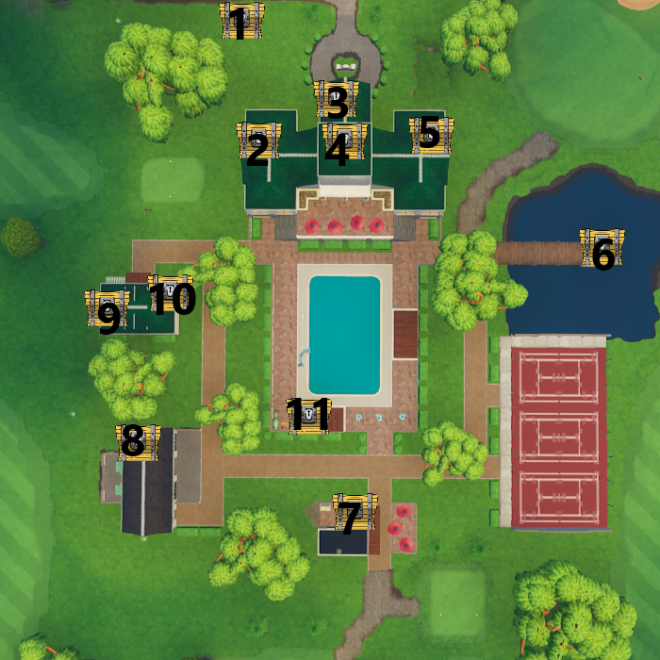 As normal, a map of each location is listed below along with descriptions into each chest’s location. Located in the far North left side, inside of a building filled with dirt. Inside of a fenced in area in the middle left side right behind a gravestone. Inside the middle most building on the left side. Two chests can spawn in this location on opposite ends of the wall from each other. This chest is hidden behind a wall. Listen for its unique sound, destroy the wall, and you’ll find the chest. Inside of the building directly north of the church. Go up the stairs into the building and around the corner to find the chest. Inside the same building as number 5, simply destroy the floor to find this chest. You could also go into the hole located in the northern part of the outside of the building to get to this chest quicker. Under the church. There is a hole in the south-east side of the church that will immediately lead to this chest. On the back of a truck between two trees just outside the perimeter. Inside the center building. There’s a hole in the center; the chest is on a platform around the outside. Underneath a white roof. Destroy the roof to access the chest. Inside the little tower on a table. In the southern part of the caves behind a wall. In the eastern part of the caves behind a wall. In its enclosed area to the southeast cavern area, behind a wall. In the back of the truck in the parking lot. Under the roof of the western wing of the main building. Under the roof of the northern wing of the main building. On the very top of the main building, under the roof. Under the roof of the eastern wing of the main building. You must destroy the north-easternmost roof to expose the chest. Under the gazebo in the middle of the lake. Behind the counter of the southern bar. In the garage in the far back right side. Under the roof of the western building, destroy the far west side to expose the chest. Behind the counter of the western building. In the building south of the pool behind a curtain. In the coffee shop underneath the basketball court. Go behind the counter and into the back room to find this chest. Behind a broken wall at the southern part of the inside of the coffee shop. Listen for the chest, and destroy the wall to find the chest. Go into the building and all the way up the stairs. At the top of the stairs take the door on the right and you’ll end up outside on a balcony. Destroy the wall to the right of the balcony to expose the chest behind some wooden pallets. On the first floor apartment. Go into the building, but instead of taking the stairs, go into the room ahead of you, proceed to the room in the back, the chest is in that bedroom. In the middle of the courtyard. Underneath the red stone floor on the right closest to the underpass. On the back of a truck to the west. Crouch under the garage door on the west side of this building. Go down and around, and the chest will be on the back of a truck. On a ledge on the top floor of the building. Inside the top of the clock tower. Destroy the roof or one of the windowed sides to access. Inside the middle portion of the clock tower. Either destroy the side walls or drop down to it from the top of the clock tower. In the gas station behind the counter, destroy two wooden boxes and go underneath a broken floor. The chest is on a shelf. In the gas station behind the counter, destroy two wooden boxes and go underneath a broken floor. The chest is under the stone steps. On the top floor of the apartment building on some wooden pallets. While in the staircase on the top floor, destroy the wall to the right of the door leading out and the chest will be behind a box. Inside the semi in the middle of the street. On the bottom floor of the left L building on a washing machine. In the top floor of the left L building behind a dresser. In the top floor of the right L building in a bathroom. In the top floor of the building under construction, on a ledge overlooking a window. Behind a wall on the second floor. Immediately upon arriving at the top of the stairs, it’s behind the wall straight ahead. Inside the garage on the back of a truck. In the grocery store back room. 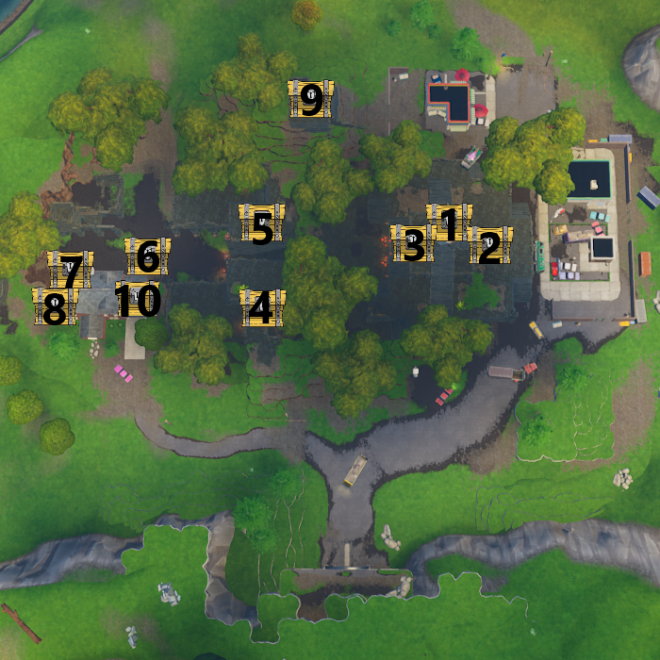 Head to the roof of the grocery store and destroy the 1×1 wall at the top to expose this chest. On the sixth floor of the castle-shaped building on some wooden pallets. On the fourth floor of the castle-shaped building on a table. On the second floor in an office. On the second floor, hidden behind a wall that has a table and two chairs in front of it. Under the bridge inside the semi truck. Front entrance of the center construction building. On a scissor lift in the middle of the center construction building. Under the center construction building. In front of the scissor lift. Behind a wall between the first and second floor while moving upstairs. Listen for the sound of the chest. In a bedroom on the top floor on the bed. Behind a broken wall in a construction area on the fourth floor, destroy the wall to gain access to the chest. On the fifth floor, destroy the wall to the left of the window (closest to the bathtub) to gain access to this chest. On the back of the truck on the northern hill. In the attic of the northern building. On the second floor of the northern building. On the first floor of the northern building. On top of the RV to the northeast. In the picnic area to the east. On the back of a truck in the southeastern corner of the center area. On a platform behind the movie screen. Inside the western building, in the back bathroom in a stall. In the attic of the western building. 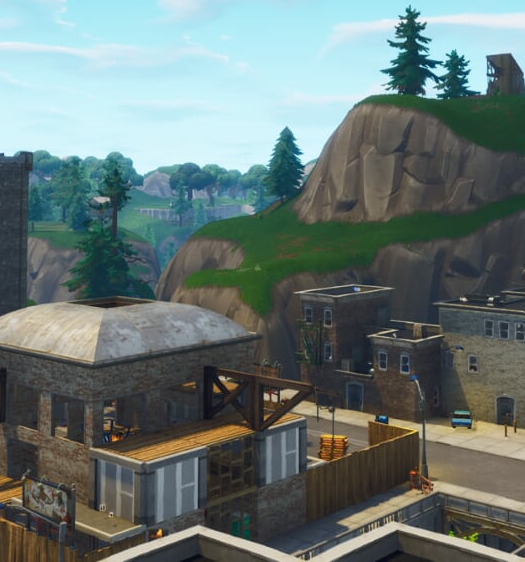 The stone heads have moved around since the start of season five. 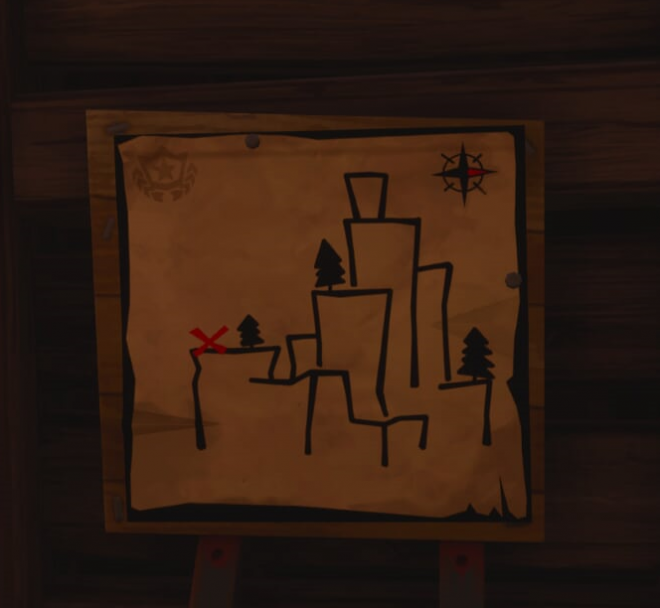 Below is a map of the new locations of the stone heads. Some of them are still in their same locations while others are in new positions. There are seven in total, which is exactly how many are needed for the challenge. Assault rifles are the required weapon in this week’s eliminations. Players have the choice of downing a player with another weapon and finishing them with an assault rifle in modes like duos and squads, or just eliminating them immediately in solos. There are a variety of different assault rifles that can be used to accomplish this task. It is highly recommended you don’t use the scoped assault rifle, as the damage is so minimal on the gun that it’s just not as effective as you’d want it to be. It’s probably best to stick with rare (blue) or above. That being said, doing this challenge in the Getaway LTM is the best option, as loot only spawns at rare or above. Here are the weapons to help accomplish the task. 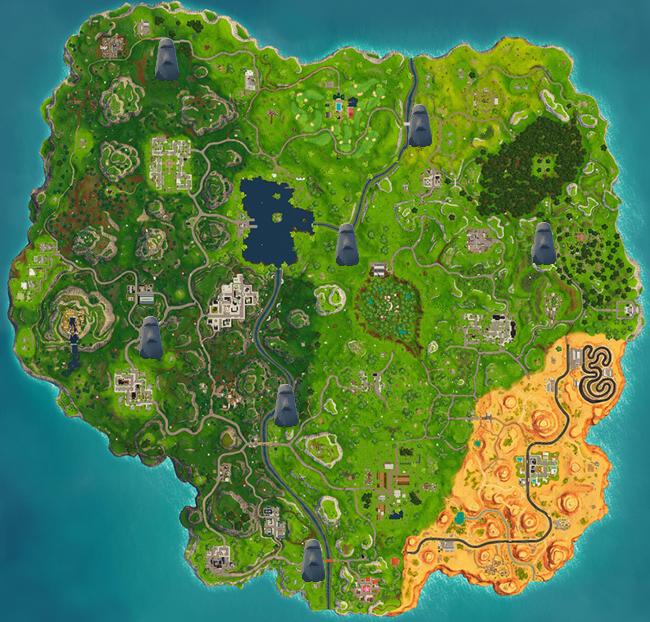 Tomato Temple is a new location in season five. It’s essentially Tomato Town turned into a giant temple grounds to worship the deity Tomato Man. Tomato Temple has quite a few more chests than Tomato Town originally had. 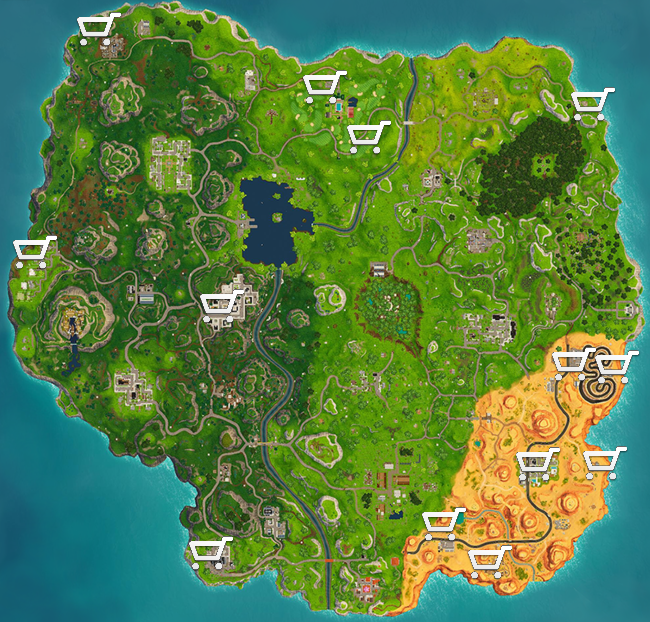 There are a total of 10 chests at the location, so there’s ample opportunity to spread out and loot before hunting down opponents to eliminate. 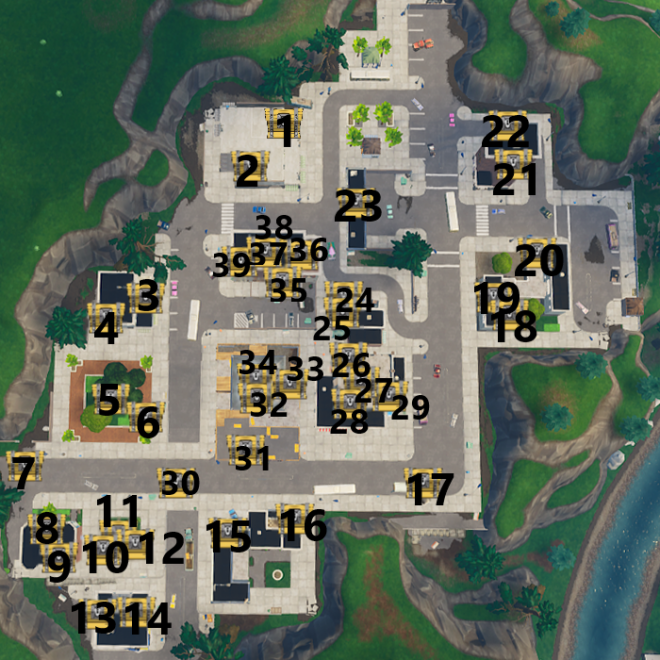 Here is a map of every chest location in Tomato Temple. On the far right side, tear down the wall and the chest will be to the in the room. On the bottom floor of the temple, the chest will be in between three ammo boxes. In the central part of the area, to the south, behind a wall. In the central part of the area on top of a wall to the north. In the dead center of the area. On top of a pillar to the west of the central area. In the attic of the house. In the ruins to the north. Do you still have other challenges? We have guides for every week of season five.